"Stern and Just 凛然重义 (lǐn rán zhòng yì)"
In the old SGS, we used to say that Yuan Shao 袁绍 had heritage, and Liu Bei 刘备 was a descendant of Han Emperors. That's nothing when you come face to face with Kong Rong... or so thinks the man. He is the descendant of Confucius himself. Nevermind that Confucius died 700 years before he was born. Nevermind that he is the 20th generation descendant and is probably further from Confucius than any of us are from Obama. He is a descendant!! Kong Rong himself was a famous Confucian scholar. He was a child prodigy in his childhood and a mediocre warlord in his adulthood. He later humiliated the “antagonist” Cao Cao 曹操 several times, which eventually led to the execution of his whole family. That's not really the brightest thing to do, is it? Descendant of Confucius? PROVE IT! 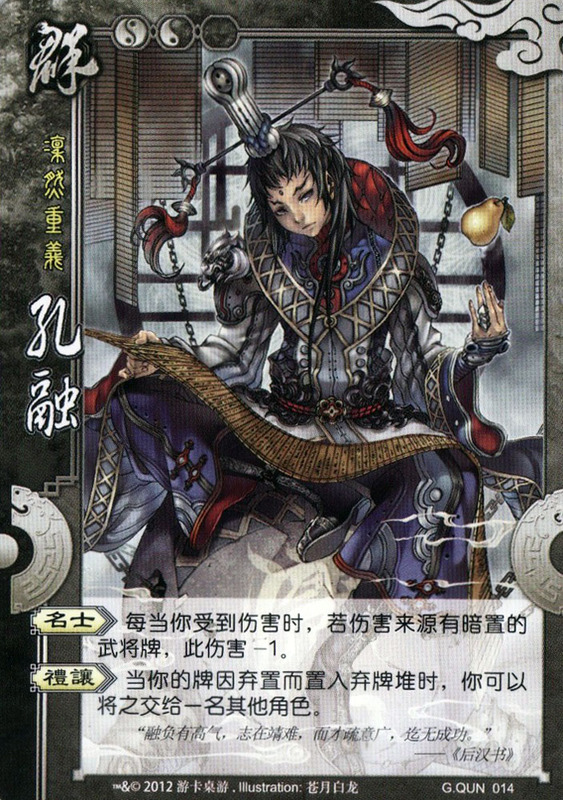 Character ability 1: "Celebrity 名士 (míng shì) "
Whenever you receive damage, if the source of damage has hidden character cards, the damage is reduced by -1. 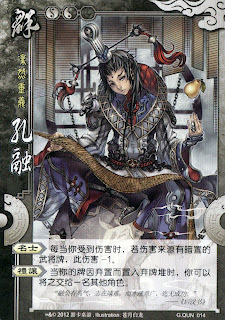 Character ability 2: "Comity 礼让 (lǐ ràng) "
When your cards are discarded into the discard pile, you can give those cards to another player. He is a brand new character specially created for Kingdom Wars. He does seem like an interesting character doesn't he? "Celebrity" refers to Kong Rong’s fame as a Confucian scholar. People with hidden ambition (hidden character card) cannot harm him. This ability is pretty powerful in the early stages, but useless in latter stages. This suits the fact that Kong Rong remains unscathed in his early days for the fear of losing support from Confucian scholars. In his later days, his fame could not protect him. "Comity" refers to his personality towards those who were admired by him. A famous story was “Kong Rong ceding the pear 孔融让梨”, where the young Kong Rong gave the big pears for his brothers, and picked the smallest for himself, symbolizing filial love. As an official, he recommended Mi Heng 祢衡 to Cao Cao, saying that Mi Heng possessed talents superior to him. In Kingdom Wars, he could give his discarded cards (actively and passively) to other players. This is a character with very interesting skills, I hope it gets tweaked and make it to the original SGS. There's also a pear in the picture. does that mean after i use an ATTACK or any tool card then i discard, i can give it to another player?